Uefa president Michel Platini says he is keen to ensure Liverpool will not have to play on the anniversary of the Hillsborough tragedy. The second leg of the Champions League quarter-final may be on 15 April. This will mark 20 years since 96 people died at Liverpool's FA Cup semi-final against Nottingham Forest. Platini said: "We will do our utmost to make sure that the club does not have to play its Champions League second leg quarter-final match on that day." Uefa issued a statement reacting to reports claiming it had rejected an appeal by Liverpool to avoid playing on the anniversary date. 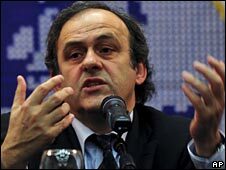 Platini said: "We are aware of the huge significance of the 15 April date for both Liverpool and their fans. "I have been in regular correspondence with Liverpool FC on this matter for some time now and fully sympathise with the club's feelings as to the importance of respecting the date of 15 April for those who lost their lives at Hillsborough. "This being the 20th anniversary of that tragic disaster in 1989 makes it even more relevant and we will take this into account." The Champions League quarter-final draw takes place on Friday.